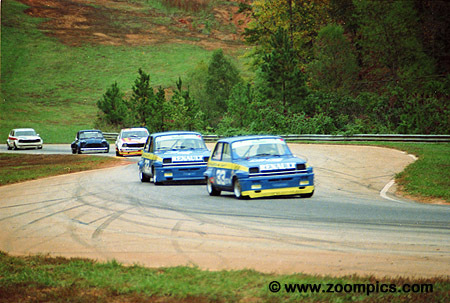 The 1980 Champion Spark Plug Road Racing Classic took place at Road Atlanta on the weekend of October 24-26. The event would decide the Sports Car Club of America's (SCCA) National Champions in 22 classes. The event took place under mostly beautiful weather - the exception being damp conditions for those competing Friday afternoon. Over 500 racers were entered from the U.S. and Canada. They came from seven different geographical regions as determined by the SCCA. It was drivers from the Central division (Ohio, Michigan, Illinois, Wisconsin, Indiana, Minnesota) that dominated the event - taking home 12-National Championships. The next closest with three were competitors from the South Pacific (southern California, Arizona and Nevada) division. This was Jerry Hansen's twenty-eighth Runoffs start. He put his Lola T-333CS on the pole - over 4-seconds quicker than second place starter Bob Allen. At the start, Hansen allowed Allen to lead but passed him on the eighth lap. After 18-laps he managed to score his twenty-first National Championship and tenth in A Sports Racing. 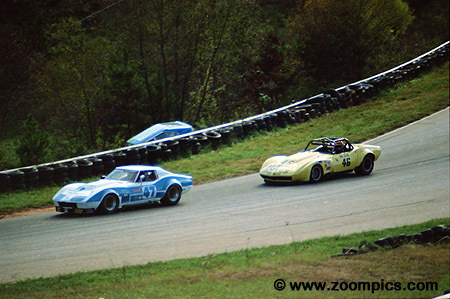 Fred Baker qualified the Gran Turismo Jaguar XKE on the pole and won the C Production National Championship. Baker's title was quite an accomplishment on a number of fronts - the Jaguar was potested for its brakes and air intake and he overcame getting bumped by Jim Fitzgerald at the start. Baker ended Nissan's streak of ten consecutive National Championships in C Production. During the D Production there were four different leaders in four different models. At the start it was David Finch in a Porsche 914. 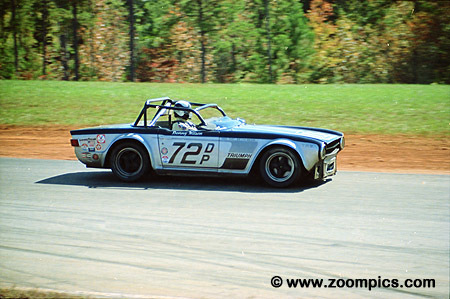 A Lotus Super 7 driven by Tom Nehl and Dennis Wilson in a Triumph TR-6 also led. But at the checkered flag it was Doc Bundy in Porsche 924 beating Wilson. The Runoffs was not without drama. On Wednesday Tom Brennan crashed his Porsche 924 beyond repair. 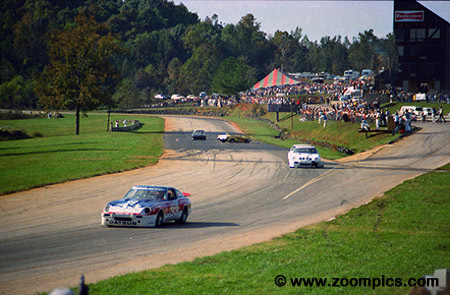 Porsche shipped a 924 body in white to Road Atlanta - arriving on Thursday afternoon and assembled by Friday afternoon. Failing to qualify as a result of the crash Brennan started last but finished an incredible fourth in D Production against a very strong field. 1979 F Production champion Steve Johnson qualified second but he stalled his Triumph Spitfire on the grid and started last. After 18-laps he moved through the field to finish fourth. Taking the 1980 F Production Championship was Jerry Barker also in a Triumph Spitfire. Central Division competitor Paul Brand of Minneapolis, Minnesota scored a popular win in E Production with his MGB. Brand led laps-8 through 18 to take a 10.815-second victory over Dan Gilliland in a Porsche 914. GT2 pole-sitter Bill Coykendall in the No. 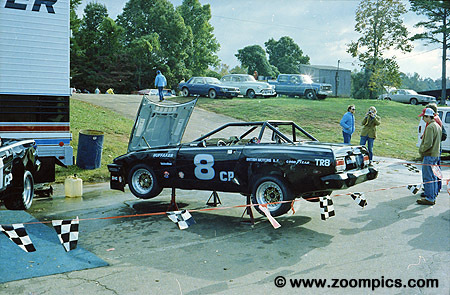 63 Datsun 200SX and second fastest qualifier Dave Frellsen in a Datsun 510 were selected by Sports Car Magazine as two of the favorites to win the class. But it was Frellsen who won the 1980 title - this was his fifth National Championship. He made it difficult for himself by sliding off the damp track on the first lap but worked his way back from fifteenth. 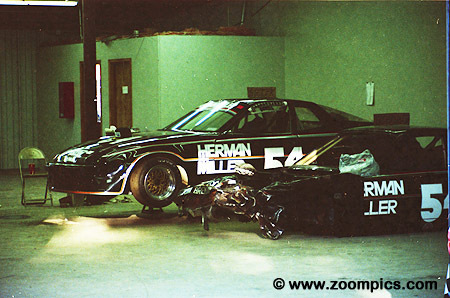 I'm not sure what incident occurred that resulted in the damage to this Mazda RX-3 SP. 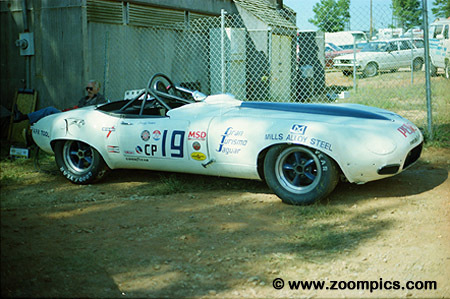 According SCCA records, this car was driven by Marla Benton. She qualified twenty-second in Showroom Stock B and finished twentieth completing 16 of the 18-lap race. 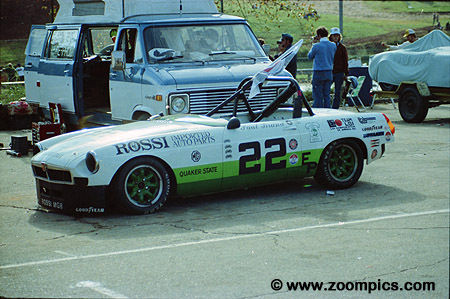 She entered the 1984 Runoffs in a Showroom Stock C Nissan 200SX but did not qualify. Overcast skies with the threat of rain produced a challenge for G Production racers - rain or dry tires. The field was almost split evenly over the choice of tires but it was those who selected slicks that made the right decision. One of the drivers to guess correctly was Travis Duder in a Triumph Spitfire he would finish second to Steve Schwitters in an Alfa Romeo Spider. C Production saw a lot of contact. It began at the start when second faster qualifier Jim Fitzgerald leaned on pole-sitter Fred Baker. On lap-8, Logan Blackburn, second in the photo, clipped the Triumph TR-8 of Ken Slagle. This resulted in Slagle's retirement. 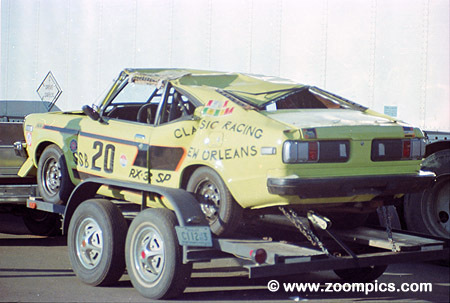 Blackburn would finish fourth in his damaged Datsun 280ZX. 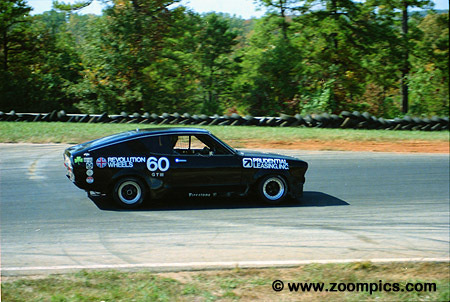 Bruce Nesbitt in a Datsun B210 traded the lead several times with eventual National GT3 Champion Tom Davey. Midway through the race Nesbitt made a pass on Davey at turn-11 that sent him off track. This resulted in a memorable charge by Nesbitt - he finished in the runner-up position just 0.844-seconds behind Davey. Jaguar/Rover/Triumph had four C Production Triumph TR-8s entered in the 1980 Runoffs. Three of these models were prepared by Huffaker Engineering. The No. 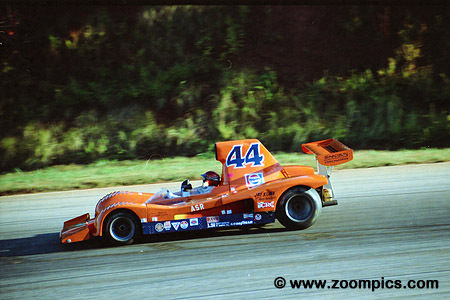 8 Huffaker Triumph TR-8 was driven by Bruce Qvale to a sixth place finish. 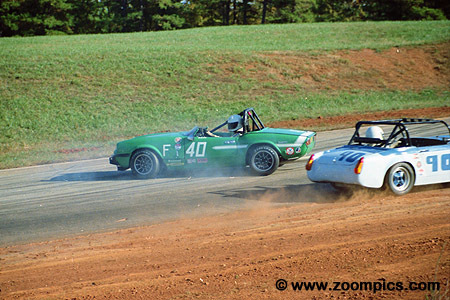 The F Production MG Midget driven by Stanley Fisher avoids the spinning Triumph Spitfire of Mark Van Orsdale. Van Ordale would finish nineteenth and Fisher thirteenth. The factory involvement of Porsche and British Leyland was expected to be the highlight in the D Production race. But Dennis Wilson in an out of production Triumph TR-6 gave the factory efforts all they could handle. 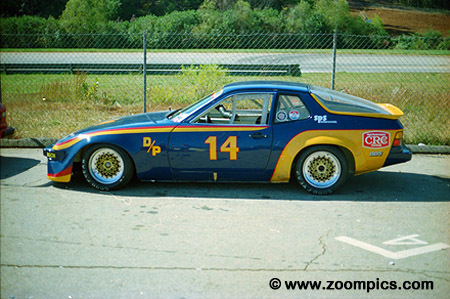 Wilson led laps 9 through 14 and finished just 2.155-seconds behind 1980 D Production winner Doc Bundy in his Holbert prepared Porsche 924. 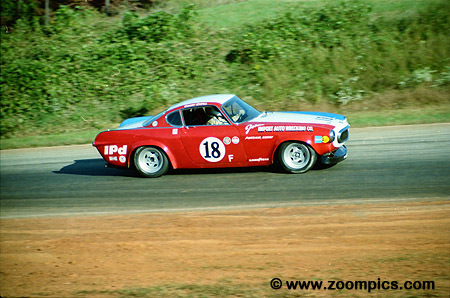 The Volvo P1800 was driven by Gary Small from Gresham, Oregon. 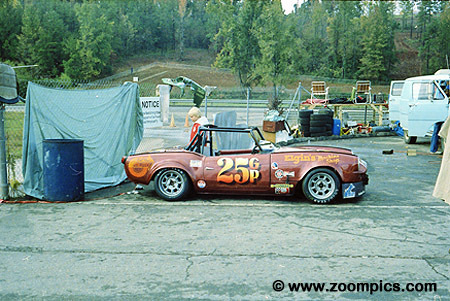 Small finished second in F Production at the 1980 Runoffs. This Volvo was produced from 1961 to 1973. Initially, this model was available with a 1.8-litre engine and later it was manufactured with a 2.0-litre motor. This is an interesting contrast to the F Production British Leyland cars that had of displacement of 1.3 or 1.5 liters. 1980 saw the debut of Sports 2000 as a National class. 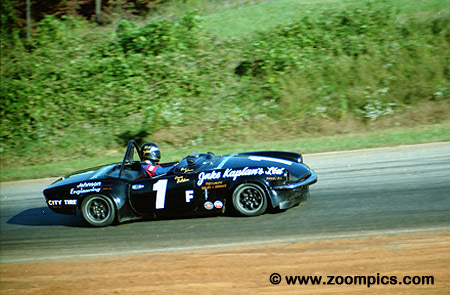 Fastest qualifier among the 22-car field was John Paul Jr. in a Lola T-590. Paul led laps 1 through 10 before he retired with engine problems. Steven Glassey driving a Tiga SC80 won the National Championship and was followed across the finish line by John Fergus and Rex Ramsey. 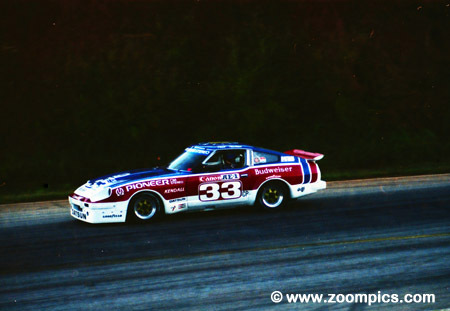 Paul Newman won the 1979 C Production National Championship in a Datsun 280ZX. 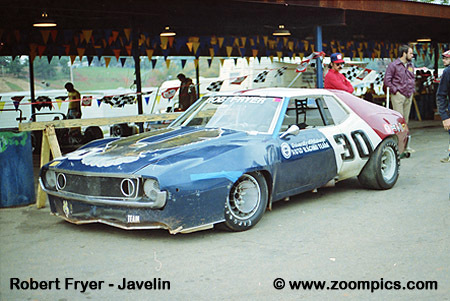 In 1980, he qualified sixth and finished 6.906-seconds behind Fred Baker to take second in C Production. 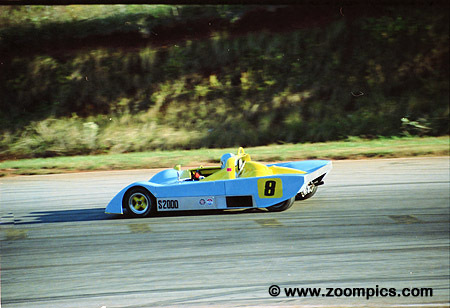 Seven years after its introduction the David Bruns designed ADF Mk II proved to be the class of the Formula Ford field. 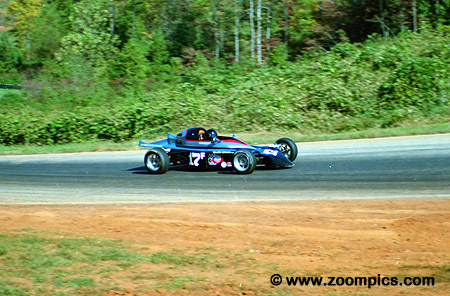 Bob Lobenberg driving the No. 17 ADF won the 1980 title. Rounding out the podium was second place finisher Kip Laughlin in a PRS-80 and Chip Ganassi driving a Crossle. 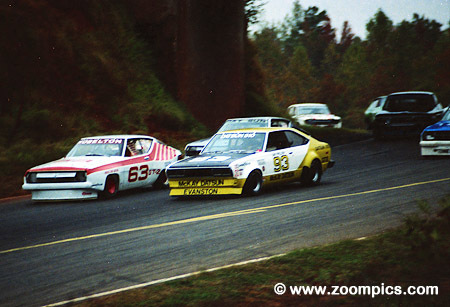 Doug Bethke follows Bill Leonard through Road Atlanta's turn-12. Bethke would finish third in B Production while Leonard would capture seventh place. Visible in the background is David Stager's VW Scirocco which went over the guardrail during the second lap of the GT3 race. The Stewards decided that the car would be removed after the day's events so that the schedule could be maintained. GT4 could best be described as the Archer Brother's show. Tommy leads Bobby on the opening lap through the 'Esses'. Tommy qualified on the pole and led the first lap - ultimately he finished second. His brother Bobby also in a Renault Le Car qualified second and led the most important lap to capture the National Championship.